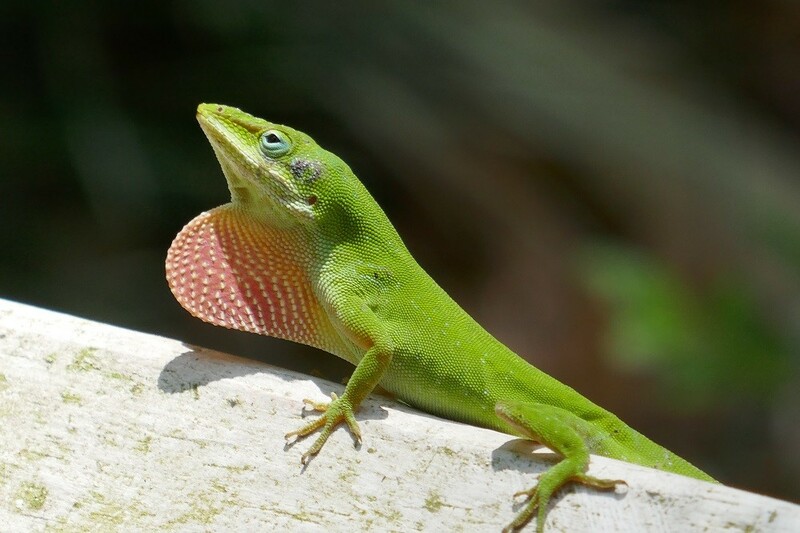 You can learn more about green anoles from my article … Green Anoles in Central Florida. A newly emerged baby lubber grasshopper. It will turn black in a few hours. I was searching for information on Spanish needles and found your site — it’s fabulous! I’m also a Floridian and a bird, bee, butterfly and wildlife lover, including the “weeds” my neighbors make snide comments about. Not to worry, the spiderwort and spanish needles are here to stay. Thanks for all the great info. I’ll be back. Hi Deb! It’s fabulous to hear that the weeds are there to stay! I love it … thanks for letting me know! It’s unfortunate that people label our native wildflowers as weeds, but that’s the way it is I suppose. Please do stop back by because I’m always writing new articles. Thank you for stopping by and letting me know you appreciate the info on my site. That’s always very nice to hear. Natural Florida is going away very quickly so weed warriors like us need to stick together and keep up the good fight. Enjoy your natives! Hi again, Sharon. I wonder if you have any advice regarding Lubber grasshoppers? I have a strict no-kill, no-pesticide use rule here, and the little guys are hatching like crazy and doing a job on my dune sunflowers and gallardia and I have a feeling they’ll be in my bell peppers soon. Last year I tried collecting the hatchlings and putting them in a bucket of soapy water, but this year there’s way too many for that. I’ve been able to stomp and squish many of them this year (I know my neighbors love the crazy-lady “show”). Do you have them in the Tampa area, and if so, what do you do to keep them off the milkweek, etc. They seem to love my spiderworts, too. Oh my. My advice is leave them be so the mama birds can feed their babies. Lubber grasshopper babies emerge in the spring to coincide with all the new songbird babies of spring. 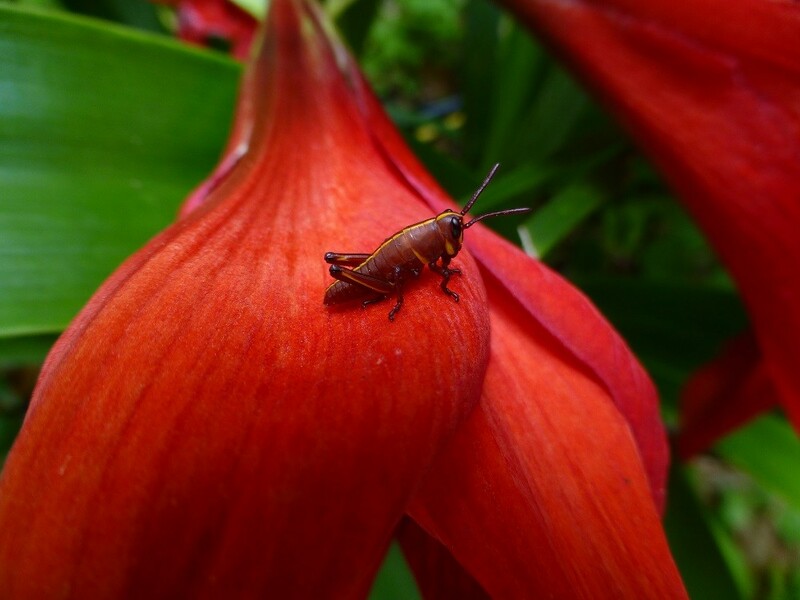 Lubber grasshoppers are a very important food source for our songbirds in the springtime. Killing them deprives baby songbirds of much needed nutrition. Spiderworts are so prolific grasshopper damage is rarely noticed. Unless of course you have one spiderwort plant then the damage could be significant, but when the grasshoppers are small they can only eat the surface of the leaves or new growth anyway so it’s mostly cosmetic damage. Of course once they gain size they consume more vegetation, but I rarely find one or two mature lubber grasshoppers by the end of spring because the birds have dispatched most of them. I would suggest moving the baby grasshoppers to a weedy area or some place in your garden where their chewing won’t appear so noticeable. Oak tree caterpillars are much more of a problem right now than grasshoppers. The best way to control either of them is to move them. Everyone wants songbirds, but won’t tolerate the bugs and weeds they need to survive. It’s pretty silly. Nature is a complex web of life. It’s absurd to pick out one or two aspects to appreciate and then poison the rest! Of course it’s done every day, but I don’t agree with it. I love when the green anoles come to visit! The lubber infestation has been out of control on my property this year, but I’ve decided not to fight them. It’s just too daunting a task. Plus, you know my philosophy, survival of the fittest! Hey girl! Thanks for stopping by! Yes the baby lubbers are everywhere this year. I didn’t move them off my amaryllis and they’ve turned them into a mess. Bugs gotta eat! Happy Earth Day to Me! The baby lubber grasshoppers are here … be happy for the mama birds! Sharon on The baby lubber grasshoppers are here … be happy for the mama birds! Deb on The baby lubber grasshoppers are here … be happy for the mama birds!